LANCASTER, Pa. (AP) — The handiwork posted outside a small classroom in the heart of Pennsylvania’s Amish country hints at the ambition of the refugees studying at Phoenix Academy. I come from Africa and want to be an economist. I come from Tanzania and want to be a teacher. I come from Cuba and want to be an architect. Their favorite subjects are math, English and science. Yet how to help these 17- to 21-year-old high schoolers pursue the American dream — even as the country debates broader immigration issues — is a question dividing advocates in several federal lawsuits. The Lancaster community, steeped in centuries of religious tolerance, runs an “international school” on its main high school campus to help the waves of new arrivals sponsored by local resettlement agencies learn English and adjust to American schools. But the practice of sending the ones who are over 16 and have no school records to Phoenix, an alternative school across town, has rattled critics who see it as a diploma mill. The school, with uniforms and metal detectors, stresses attendance and behavior over homework, but gives students who are years behind in school the chance to make up credits quickly and get degrees. About 20 of the school’s 350 students are refugees. U.S. courts have so far agreed, in temporary orders that let six former Phoenix students — from Sudan, Somalia and other troubled countries — attend McCaskey this year. A full trial on the issue is scheduled for this summer, although a settlement conference is scheduled for April. The case, filed last summer, is now unfolding as the Trump administration tries to roll up the welcome mat for some refugees and immigrants. Superintendent Damaris Rau calls the case demoralizing. She oversees an impoverished district of 11,300 students, 5 percent of them refugees and 17 percent immigrants. Rau, a Latina from New York, came to Lancaster 18 months ago, lured by the community spirit. The area has long been home to people fleeing persecution, from the Amish and Mennonites who started arriving in the late 1600s to the Bhutanese, Somalis and Syrians who have come in the past decade. Banners around town welcome newcomers in Spanish, English and Arabic. The district partners with community groups to host a health clinic, refugee welcome center and adult English classes at a middle school, and sends food “power packs” home on weekends to families in need. Rau believes the older refugees — who may have no formal education, or be married, or need to work — do better in the smaller Phoenix program, with concentrated, semester-long coursework. They don’t have enough time to earn degrees at McCaskey before they age out at 21, she said. But the Phoenix students who testified for the ACLU said they didn’t know enough English to understand their classes. 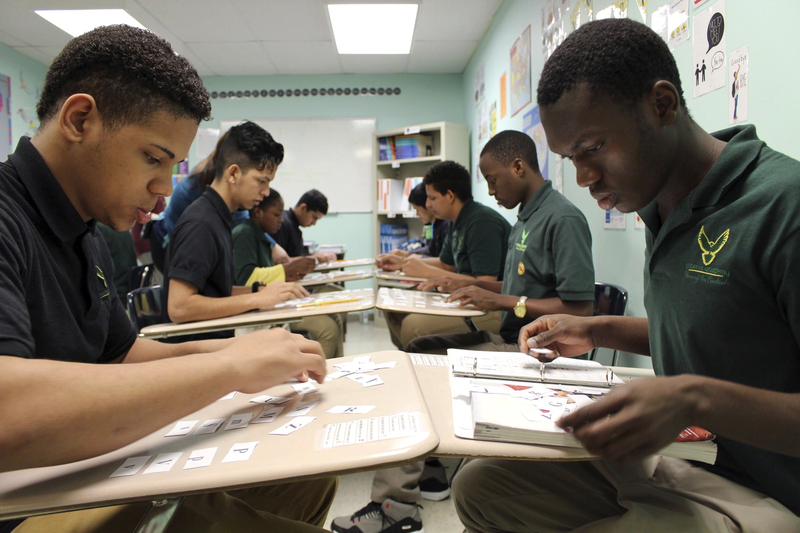 At McCaskey, students learning English take “sheltered” classes with each other for about a year. Both schools also offer intensive English-language classes. Phoenix student Shukuru Amanya, 18, the aspiring teacher, was born in a refugee camp in Tanzania to parents who had fled Congo. She said she attended school there, in French, through 11th grade. Her husband, 20-year-old Patient Inganya, who also spent his life in the camps, said he nearly finished his degree before they came to the U.S. last fall with their 2-year-old daughter. Neither had any school records, so they were placed at Phoenix. Inganya will have to settle for a GED diploma after aging out of Phoenix this year. He works the second shift after school at a local warehouse, one of the many entry-level jobs — at employers like Urban Outfitters and Hatfield Quality Meats — that draw refugees to the region. More than 600 students have earned degrees at Phoenix since the district hired for-profit Camelot Education to run it, for $4 million a year, in 2011. School officials say many of them move on to community college.